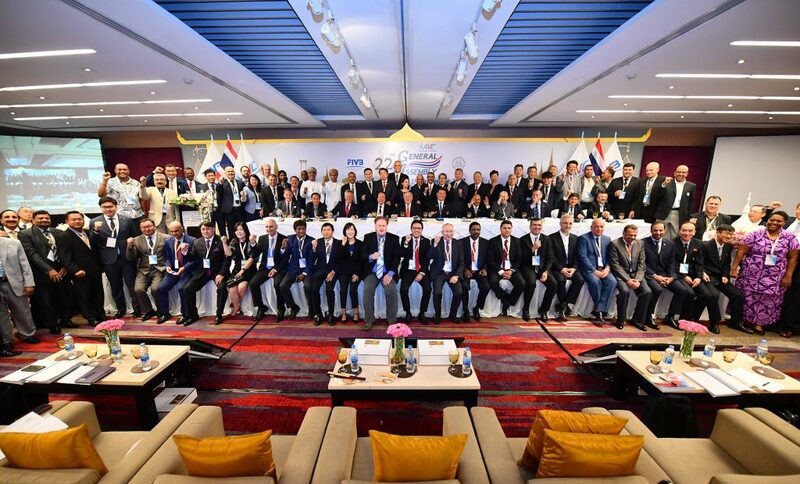 Bangkok, Thailand, November 16, 2017 – The 22nd AVC General Assembly at the Centara Grand Hotel at CentralWorld Bangkok came to a fruitful conclusion on Wednesday, with agenda and the Minutes of the previous Assembly in Riyadh, Saudi Arabia two years ago getting approved and Zonal activity reports and proposals from Technical Committees made. AVC President Dr Saleh A. Bin Nasser and FIVB President Dr Ary S. Graca jointly chaired the Assembly, while FIVB and AVC Honorary Life President Mr Wei Jizhong, AVC Executive Vice President Mr Essa Hamza Al Failakawi, AVC Executive Committee Members comprising Mr Cai Yi, Mr Shanrit Wongprasert, Mr Ibrahim Abdul Malik Mohammed, Mr Craig Carracher, Dr Mohammad Reza Davarzani also took centre stage in the meeting. Guests of honour included CEV President Mr Aleksandar Boricic, CEV Senior Vice President Mr Renato Arena and CEV Vice President Mr Hanno Pevkur. Mr Sakol Wannapong, Governor of the Sports Authority of Thailand, and Thailand Volleyball Association President Mr Somporn Chaibangyang delivered welcome speeches on behalf of the host country. Later on, AVC President Dr Saleh A. Bin Nasser gave an opening address, saying that the 22nd AVC General Assembly proved to be a platform to help all AVC affiliated national federations share ideas and discuss about all issues concerned. Moreover, it has also given all national federations an opportunity to help develop volleyball in Asia aside from supporting the FIVB President Dr Ary Graca’s initiatives for sustainable development of the world’s volleyball-governing body. Dr Saleh praised all national federations for their excellent cooperation and supports for all AVC activities. FIVB President Dr Ary Graca mentioned that volleyball became the most popular sport in broadcast programs at the last year’s Rio Olympic Games. Volleyball has been regarded as the first-choice sport of children and women and it’s the sport with no violence, no contact and no struggle. “I came here to bring solutions and give opportunity to all of you. It’s what in my ideas for development of volleyball in Asia,” Dr Ary Graca said in his speech. AVC Secretary-General Mr Shanrit Wongprasert reported that representatives from 46 federations and 10 proxies were present at the Wednesday’s Assembly, totalling 56 federations out of 65 AVC affiliated national federations. However, with four provisional suspensions, only 51 federations attended the 22nd AVC General Assembly in Bangkok. The Assembly then approved the agenda and the Minutes of the previous AVC General Assembly in Riyadh, Saudi Arabia on November 17, 2015 ahead of Dr Ary Graca’s presentation, which aims at taking volleyball to a new level in Asia. The FIVB President informed the Assembly about the Volleyball Nations League, which will replace the World League for men and the World Grand Prix for women in 2018, with more teams having an opportunity to test their mettle against the losing strong teams in the challenge group. Dr Ary Graca said that most of the FIVB income came from TV, not sponsors and he is convinced with the initiatives to change the World League and the World Grand Prix to Volleyball Nations League. “It will be a good product to sell and a tool to make money,” he insisted. Dr Ary Graca also talked about a significant success of volleyball and beach volleyball at the 2016 Olympic Games in Rio de Janeiro, Brazil. “Beach volleyball is No.1 sport in the broadcast programe at the Rio Games and it has already become the most-watched sport at every Olympic Games. Snow volleyball is a new-brand event of the FIVB. Next year, there will be the European Snow Volleyball Championship for the first time and I believe sooner or later the snow volleyball competition will be included in the Winter Olympics,” he said. After that, Dr Saleh A. Bin Nasser presented his report to the Assembly, expressing his sincere thanks for great supports of all national federations to the AVC which made great successes of all the AVC activities. He valued the efforts and hard work of all federations to promote volleyball across the continent and raise the spirits of the Asian Families. The AVC President’s report was followed by series of zonal activity reports from five AVC Zonal Executive Vice Presidents comprising Mr Cai Yi from Eastern Zone, Mr Ibrahim Abdul Malik Mohammed from Western Zone, Dr Mohammad Reza Davarzani from Central Zone, Mr Craig Carracher from Oceania Zone and Mr Shanrit Wongprasert from Southeastern Zone. In his report, Mr Shanrit informed the Assembly that the Southeastern Zone has initially planned to get the first Asean Women’s Grand Prix off the ground next year. The four-a-side, home-and-away competition attracts Indonesia, Thailand, Vietnam and the Philippines to vie for the top honour and the shared prize money of US$200,000 and will be held with an aim of promoting volleyball in the region because the sport has already hit a fever pitch in Southeast Asia and Thailand in particular. Mr Essa Hamza Al Failakawi, AVC Executive Vice President and Chairman of the AVC Finance Committee, presented report to the Assembly on the Cashflow for 2016 and the Budget for 2017, convincing all national federations that the financial support for all national teams remain, but for their activities, consideration for budget approval will be made case by case. In terms of the current situations and controversial issues in some federations, FIVB and AVC Honorary Life President Mr Wei Jizhong informed that the Philippines’ case has been cleared, while the controversies in India and American Samoa must wait for FIVB’s final decision. Mr Kenji Shimaoka, President of Japan Volleyball Association, from the Eastern Zone and Mr Ali Ghanem Al-Kuwari, President of the Qatar Volleyball Association, from the Western Zone received an overwhelming majority of the votes from the Assembly to become new Members of the AVC Board of Administration. Activity reports and proposals by chairpersons of AVC Technical Committees and Council were also made after that, focusing on the innovative actions and ideas to raise the profile of the sport to unmatched heights, something to learn from the past for a brighter future of all AVC competitions and activities. Mr Hamza informed the meeting attendants that the next AVC General Assembly is expected to be held in 2019, but FIVB President Dr Ary Graca purposed that it take place in 2020, the same year that FIVB will hold its World Congress. AVC President Dr Saleh A. Bin Nasser delivered a closing speech, saying that he appreciated excellent cooperation from all national federations and the continued supports from Thailand Volleyball Association. At night, FIVB President Dr Ary Graca, AVC President Dr Saleh A. Bin Nasser, all the AVC Executive Committee members, CEV President Mr Aleksandar Boricic,CEV Senior Vice President Mr Renato Arena, CEV Vice President Mr Hanno Pevkur and all delegates from AVC affiliated national federations were cordially invited by TVA President Mr Somporn Chaibangyang to join the Thai Touch Dinner on the 26th floor of the Centara Grand Hotel. A stunning sound and vision spectacular with dazzling performances lit up the memorable night to all delegates and distinguished guests.